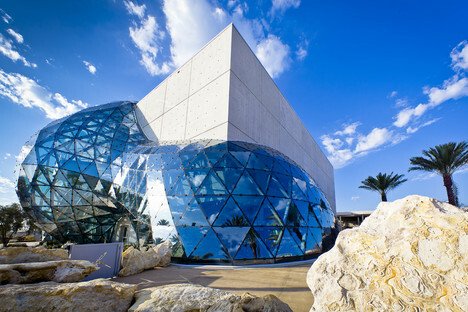 The Dalí Museum of St. Petersburg (Florida, USA) has been nicknamed the “treasure box”, as the over 2000 works by the famous Catalan painter are sheltered by this concrete building, characterised by a free-form glass and steel bubble. When the HOK architects designed the Dalí Museum, they had to face a big challenge: if the museum had not been up to the task, the hurricanes up to category 5 hitting this area could have wiped away the 2000 works by Salvador Dalí in no time. Hence, the designers realised a reinforced concrete shell whose thickness (18 inches, approx. 45 cm) would have let the clients sleep soundly, knowing that the works were safe. This is not all: the architects also combined this simple volume with a seductive, yet unusual, geodetic structure made of glass and steel, which characterises the entire museum, making it more peculiar. This sinuous element, in contrast with the other simpler geometrical building, is composed of two parts: Enigma2, which is 75-feet (approx. 23-meter) high, and Igloo, which is 45-feet (approx. 14-meter) high. Igloo groups all the windows of the building in the very same area, allowing the light in the public spaces, while keeping it away from other sections of the museum. The 1062 triangular sheets of laminated glass are all different from one another and are installed on a geodetic steel net so as to create the unusual shape of the building. Solid connections between the glass sheets and the structure are a characterising element of the building design and protect the building itself from the action of the strong winds that could hit it. The so-called “black plaster light cannons” only focus natural light on seven large masterworks, compensating all other works with direct light, according to the curatorial standards. SIZE: 68,000 sq. ft. / 6,300 sq. m.